All parents will know that when your child learns to walk, that also means that they start to explore. When this happens you will suddenly realize that things around the home that you never thought could be a danger to anyone, suddenly are and there is no knowing what a child will find. In order to avoid any problems or dangers, we must child proof our homes and there are some amazing products on the market which can help you to do exactly that. The problem is though, if you are living on a budget then whilst necessary, buying the products to child proof your home can put a quite a bit of financial pressure on your shoulders. To help you out, we’ve put together some handy hints on how you can child proof your home, without blowing a fortune. Instead of buying covers so that your little ones can’t turn the gas on the stove, simply remove the knobs, this can be done easily and you can simply put them back on when cooking. When it comes to keeping your kids from getting into the fridge to devour and play with everything that is in there, simply attach a 3M hook on the side of the door and the side of the fridge, a strong rubber band between the two will ensure that your chilled food stays safe. One of the key areas in the home that you will need to child proof is the edge of tables, the kids can easily fall and hit their heads on the sharp side. Instead of forking out money for covers, simply use some foam pipe installation which can be bought for a very low prices. This does the exact same job and will cost you less than half of the price. If your child has figured out that they can clamber out of their crib whenever they like then a great hack to prevent them doing so and potentially hurting themselves is a tiny piece of fabric. Cut a strip of strong fabric out and sew it to the two legs of their baby grow. Mae sure that it is long enough that they won’t be uncomfortable and the next time they try to get out, they’ll have great difficulty getting their leg over the side. 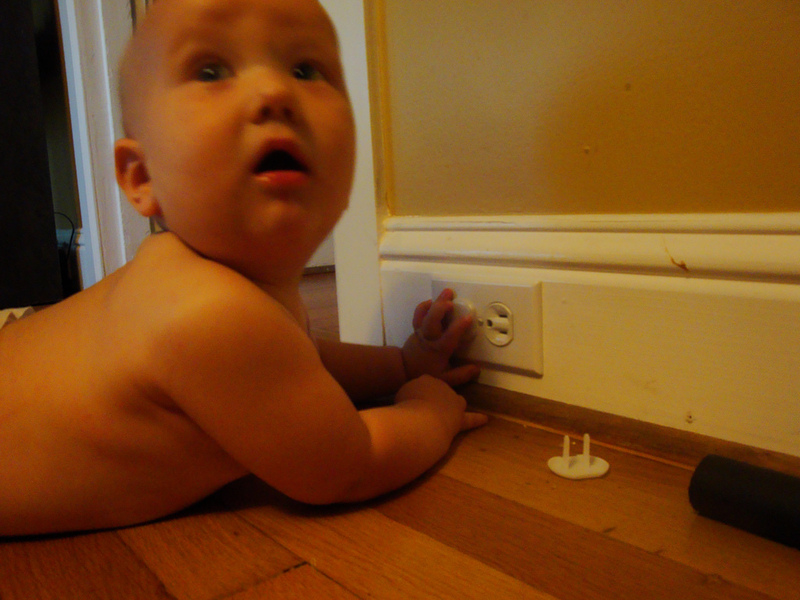 Kids and electric just screams danger and you can help to keep your little ones away from extensions by using a Tupperware container. Simply cit holes in the side of the container so that the cable can pass through, place the extension inside and seal it shut with duct tape. If you have empty sockets around the home then instead of buying protectors, simply seal them off with painters tape or duct tape. The strength of the tape will be almost impossible for your child to remove and it means that they cannot put their little fingers in the socket holes. Cheap, and electrocution free.